The wording above isn’t quite the same as the nursery rhyme you will remember from your childhood BUT I think I might just like this Lush-version a little bit more. It could actually be written about me. With so much in common me and Humpty Dumpty where obviously meant to be! The Humpty Dumpty bath bomb was a part of the 2016 Lush Easter range and was quite the size. The idea behind the bigger Easter bath bombs is that you crack the egg (bath bomb) in half (just like you would an Easter egg) and inside is a surprise… A miniature bath bomb in the shape of a fried egg! All pieces of the Humpty Dumpty bath bomb are Honey I Washed the Kids scented. Honey I Washed the Kids is one of Lush’s most famous scents. It can be found in a number of their products all year through. The Honey I Washed My Hair shampoo bar is probably my favourite out of all of the every day range products that share its scent. The Honey I Washed the Kids scent is very sweet, I can pick out honey, toffee and hints of gooey caramel… It however isn’t at all sickly. When I first got into Lush I was really worried that I wouldn’t like anything from the Honey I Washed the Kids family, I could see so many products sharing the scent and was concerned as most sweet scents I just can’t hack. I have never had much of a sweet tooth and my preferred tastes are the same as my preferred scents. The Honey I Washed the Kids scent is however one of my favourites as it’s sweet but not sickly. I now always jump to try any of the Lush products associated with it. Although the Humpty Dumpty bath bomb is huge, it doesn’t take long to fizz away once it comes in to contact with your bath water. This is the reason I always end up putting the 3 separate pieces in all at once. Comparing the Humpty Dumpty bath bomb to other Honey I Washed the Kids scented bath bombs, I do favour the alternatives. The Shoot for the Stars bath bomb appeals to me more as it’s a slow fizzer and its scents has more throw. Humpty Dumpty is a lovely Easter bath bomb, I however only had 2 from this years range as I found it more of a novelty product than anything else. If it does come back next year I think I will buy it again but not for myself, I’d get it for my nieces and nephews as an alternative to a chocolate Easter Egg. I like to get them something a little bit different than everyone else and they all love bath time so it’s perfect for them as a treat. The exfoliation of your skin has a very long list of skin-perfecting benefits. I cannot believe the number of people that do not know how essential exfoliating is for the upkeep of beautiful skin. I never used to think that it was as a very important job myself, that is until I had a chocolate sauce massage followed by the most epic sea-salt body scrub. It was a birthday treat booked by my boyfriend while we were on holiday in Egypt, we were in our early twenties at the time and ever since the experience, it has changed my skin for the better. I couldn’t get over how beautiful my skin felt and looked, I was glowing. My sun tan was the best it had ever been and my skin tone was completely even. I have a number of dark and light patches of skin all over my body. I have always been very self conscious of them and ashamed at how uneven and strange they make my skin appear. Description wise I would compare it to a very bad patchy, fake tan – which we can all appreciate is no fun at all. Once my Egyptian salt scrub was over I couldn’t quite believe what I was looking at in the mirror. For the first time ever I was confident about the look and feel of my skin. 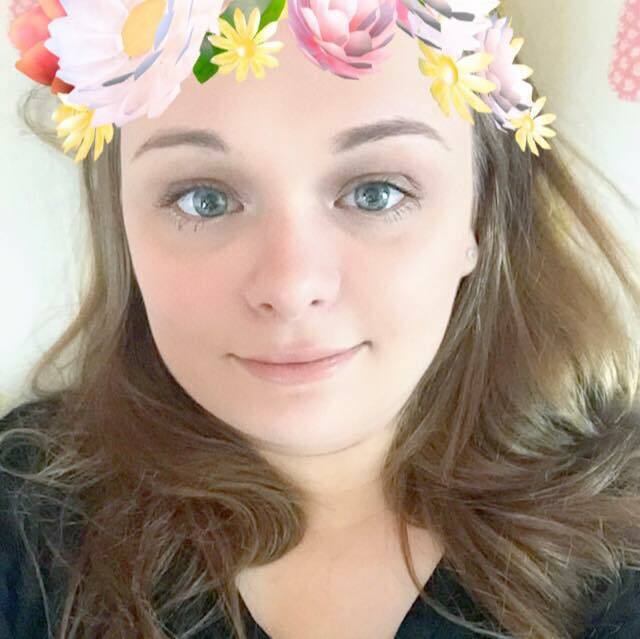 I felt amazing! Lush’s Rub Rub Rub shower scrub is the closest formula out there to whatever Egyptian magic they used on me that day. Packed with skin reviving ingredients I always make sure I have a pot of this on my shelf to use at least once a week. I dread to think of what my skin would look like without it. Sharing its scent with the Sakura Bath Bomb, Rub Rub Rub gives off a very refreshing and clean fragrance. The tiniest amount of this shower scrub goes a very long way, I have heard many positive reviews on Rub Rub Rub. For me, it evens out my skin tone, softens my skin and also helps keep any annoying black heads or breakouts at bay. It is the perfect product to not only clean and clear your pores of excess oil, dirt and yucky dead skin but also to make your skin softer in appearance as well as to touch. I’d also like to point out that the Rub Rub Rub scrub is a little more heavy duty than some of the alternative exfoliating products out there. For someone like me having an incredibly noticeable, uneven skin tone it is gold dust! It’s a fairly gentle but effective formula, not so harsh that it makes my skin sore and not so soft that I can’t see or feel the difference after using it. It is worth every penny. If your skin is sensitive I would maybe try something more gentle for your face. My go to face exfoliator is Lush’s Cup O’ Coffee. In the Winter I however stick to using Rub Rub Rub or the Ocean Salt and Face Body Scrub. The consistency of Rub Rub Rub to touch reminds me of a Slush Puppy, it however isn’t as cold, I do know of some people using it straight from the fridge though. I have yet to try it fresh from the fridge but now the nights are getting warmer I’m leaning towards giving it a go. As said above, a little goes a long way, I can scrub down the whole of my body with the equivalent of a table spoon worth of product. Rub Rub Rub isn’t just a shower scrub either, I love when a product isn’t a one trick pony. It can also be used as a shampoo, the sea salt stimulates your roots and massages your scalp so well, it’s my idea of heaven. When I use it, it adds so much volume to my flat, dull and boring hair – another problem I have. All in all I am very impressed with the Rub Rub Rub shower scrub. It also comes in a solid form but after trying both I find the potted form of it lasts longer and is better value for money. Check out my review on @LushOxfordStreet’s Sunflower Solid Deodorant, I think it might be a new favourite of mine! At the risk of sounding like a cocky know it all, there aren’t very many Lush products that I haven’t heard of. Even though I may not have tried a product, I have at the least heard of it. Oxford Street’s Sunflower Solid Deodorant was a game changer of a product for me. It had been completely missed by my Lush radar. The last time I visited the flagship store I came across it, after giving it a quick sniff, I picked up a 100g bar of it to buy. Finding it was a complete accident, I was actually looking for some Princess dusting powder. Finding it made me ridiculously happy because although it is technically an old Lush product, it was completely new to me. This wow-factor, Lush revelation feeling normally only happens to me when a new seasonal range comes out, I was buzzing! The Sunflower is probably my favourite smelling Lush solid deodorant out of the few I have tried. Although not as strong in scent, it reminds me of the (pictured below) Sunflower bubble bar. The Sunflower bubble bar was available earlier this year as a mother’s day Oxford Street exclusive, I’m hoping they decided to bring it back as it’s a beautiful product. I honestly hadn’t really ever got on with any Lush solid deodorants prior to trying the Sunflower version. I am still trying to persevere with T’eo solid deodorant which is why I haven’t completed my review on it yet. I am trying very hard to give it a fair chance however scratching my armpits to bits every time I try it, is not what I want out of a deodorant. When I first picked up the sample piece of the Sunflower solid deodorant in Lush Oxford Street, I was surprised at how smooth it was in comparison to the T’eo deodorant bar. It has a very similar consistency to a bar of soap. With the heat of my body it gradually melts, gliding easily on to my underarm area. When I say melt it is very, very gradual. It’s not the same ‘melt’ as a Lush massage bar. Once on your skin it feels just like a roll on deodorant does. It’s both deodorising and hydrating, with a light but refreshing lemon scent I really, really like it. Some deodorants are so over powering, this one is however a soft but zingy citrus scent. I have been using the Sunflower solid deodorant almost every day since I got it back in March/April. I cannot believe how long it is lasting, I can see it lasting another 6 or so months at the least. If you do get hold of some Sunflower solid deodorant I recommend keeping it in its paper packaging or getting a Lush tin for it. I find this keeps it from drying out like my Aromaco solid deodorant did. A sceptics first question on solid deodorants is, does it work? In regards to the Sunflower solid deodorant I say yes. It’s the perfect product for deodorising your under arms. It however isn’t an antiperspirant, if you’re looking for something to stop sweat too then you’ll need to combine the Sunflower solid deodorant with something else. A lot of people think that antiperspirants and deodorants are the same thing but they aren’t. One stops you from sweating as much, while the other deodorises unpleasant under arm odours. A good Lush product to pair the Sunflower solid deodorant with is one of their dusting powders. This works the same as talc and once you start using it you’ll wonder how you ever coped without it. Check out my review on the gorgeous Sakura bath bomb from @Lushltd @LushCosmetics what an amazing bath time treat! When you first walk into a Lush shop I will admit that the Sakura bath bomb isn’t the first one you see, overshadowed by other much brighter and bolder products people tend to miss it completely. When I first got into Lush Sakura was a bath bomb that I initially ignored, I didn’t dislike it I was just drawn to the other bath bombs on offer such as Twilight and Phoenix Rising first. It didn’t take me very long at all to get bitten by the Lush bug, I think out of all of the Lush products on offer bath bombs are probably still my favourite. As you cans see from the photo above no Sakura bath bomb is quite the same. Yes they are all similar as they each have the same ingredients but they are all unique at the same time. Some are white all over with a few splashes of pink, some have a small sprinkling of salt on, others are even heavily speckled with pink and/or green! When I was little we had the most beautiful cherry blossom tree in our garden, when I learnt the back story of the Sakura bath bomb I couldn’t resist picking a few up, I now always have at least one in my Lush stock. I used to love seeing our cherry blossom tree bloom with beautiful light pink flowers. I distinctly remember being beside myself with anger and sadness when a tree surgeon came over to ‘trim’ our cherry blossom tree. I guestimate that I was about four as my paternal nan was present. I did not like anyone touching my tree, I thought he was killing it, TREE MURDERER!!! ‘What has my tree ever done to you? it has feelings!‘ I screamed at him through the window, hiccups, snot and sobs galore… My family OF COURSE thinks it was hilarious to this day. The Sakura bath bomb has calming properties. If you have a scary day ahead it makes for a fantastic morning bath-time treat. It helps clear your head of stress and worries leaving you in a better state of mind and more able to face the next 24 hours. The Sakura bath bomb is quite a fast fizzer in comparison to others of its size like the Fizzbanger or the Frozen bath bomb. As soon as it hits the water the sea salt starts to soften the water as the beautiful Sakura scent hits you. When looking at Sakura’s ingredients list I imagined it to be quite a fruity product, the mimosa and jasmine within it however dominates the lemon oil and orange flower absolute. Once out of the bath the scent stays with you for the whole day. It has a very light and refreshing floral scent. Despite this I would still class the Sakura as a citrusy product – Although, if you’re looking for a dominantly strong citrus bath bomb, you are probably better off grabbing a Fizzbanger. The lemon oil and orange flower absolute may not be easily detectable by scent within the Sakura, their magical properties however shine through. After a Sakura bath I feel relaxed and ready to face any challenges ahead, my skin is soft and hydrated and any mood I find myself in lifts, making me feel more human again. If you prefer the more gentle bath bombs, Sakura is a good one to go for. Once it has fully dissolved you are left with a small amount of soft pink and white bubbles, perfect for dry and tired skin. I know quite a lot of people go for a bath bomb purely for a colourful and artistic bath, although Sakura is rather dull in comparison to other more colourful bath bombs, I still think it’s worthy of its staple product status, I cannot recommend it enough! Have you tried the @Lushltd @LushCosmetics Granny Takes A Dip bubble bar yet? here’s my review! The Granny Takes A Dip Bubble Bar was released back in 2015 as a Lush Oxford Street, flagship store exclusive. Since its original release the Granny Takes A Dip bubble bar is now available everywhere. Last year, Lush decided to retire the bath bomb version making way for other new products. I do miss the Granny Takes A Dip bath bomb however the bubble bar is a somewhat worthy replacement. The Granny Takes A Dip bubble bar shares its scent with the retired bath bomb. For the bath bomb super-fans this made the blow of taking it away a little softer. As you can see from the photos the bubble bar is very bright and cheery. Its scent really is unique, packed with lemon, ginger and pepper oil it’s both zingy and spicy. Comparing the bath bomb and the bubble bar I find that the bubble bar is a tad more refreshing in the bath tub. In the above picture I am about to use half of a Granny Takes A Dip bubble bar for one bath. Half of it makes plenty of bubbles, I’d actually go as far as to say that you could easily get 4 fairly decent baths out of just one bubble bar. I am always honest in my reviews, I do like the Granny Takes A Dip bubble bar however I feel that the bath bomb was just that little bit better. With the bubble bar you still get the full effect of its beautiful scent, it just isn’t as visually theatrical in the water. I didn’t realise until I had used my very last Granny Takes A Dip bath bomb quite how fond of the exciting colours I was. My skin after using the bubble bar was equally as soft and refreshed as the bath bomb used to leave me. I know quite a lot of people have pointed out that the colour of the water after using the bubble bar is rather dull. I actually disagree with this, although it’s not quite on par as others for brightness sometimes something a little more gentle is a good thing. I have got through several Granny Takes A Dip bubble bars since its release last year so it’s more than obvious how I feel about it. It’s the perfect accompaniment for an exciting Lush bath cocktail. Every last aspect of a Lush product is carefully picked and designed. Its scent, ingredients, shape and colours are all under special consideration. Every single part of a Lush product has a valid purpose for being there, they literally think and perfect every last detail. When ever I get my hands on a brand new Lush product I like to delve a little into its history. I like to find out a little more about how and why the wonderful people at Lush came up with such a product. This year Lush Cosmetics decided to make a line of Father’s Day products, this is the first year that they have done so. Lushie’s all over the world have welcomed this small range of new and exclusive products with open arms. After all, Lush release the most amazing Mother’s Day products so it’s only fair to let the Fathers of the world get in on the action too. The Modfather Bubble Bar although very small sure has a lot of clout. Inspired by the Mods and Rockers of Britain’s 1960’s youth subcultures, Lush have clearly had a lot of fun coming up with it. I’m not going to write an essay for you to read on Mods and Rockers, in all honesty I don’t really know much about them anyway. I can vaguely remember learning about them at school when I was 9 or 10 years old. My only real memory of it is that we watched a video recording of an old BBC documentary on the ‘TV with wheels’. The Modfather bubble bar isn’t very big at all. What it however lacks in size it well makes up for with its beautiful scent. Packed with Brazilian orange oil, the Modfather bubble bar has a super zingy and energising-summer-scent. It’s perfect for anyone looking to add a spring to their step. It’s mood brightening, refreshing and tailor made to revive all of ones senses. The only negative point I have on this bubble bar is how small it is. As a woman of 5 foot 2, I can appreciate that good things come in small packages. I am however always a little disappointed if I cannot use the same Lush bubble bar over 2 or 3 baths. I think that I am maybe just a little bubble-greedy though. The first bubble bar I ever purchased from Lush was The Comforter, size-wise I was therefore spoilt rotten, from day one. Using the whole of the Modfather bubble bar for one bath did make for an incredibly lavish bath, it was fit for a king, making it (in my opinion) worth every penny. The first time I tried it I did try to use only half of it. Half of it left me with good results but not as good as using the whole thing. Although a little pricey if used in just one bath, it was a bloody good bath that I’d love to have time and time again. Crumbling a Modfather bubble bar under a running tap produces more than a copious amount of luxurious, soft white, fragrant citrus bubbles. I have grown quite fond of the scent and hope that Lush incorporate it into future Lush products too. The picture above speaks for itself. Underneath the canopy of bubbles is beautiful, royal blue water. I have yet to come across a Lush product that leaves my bath water such a deep blue before. It’s such a lovely shade of blue, I could just lay in the water for hours. The Fizzbanger is a very popular Lush bath bomb and it is one of my all time favourites. It is a staple Lush product available all year through, both online and in store (at the time of its review). If you look through my Instagram account you can see that I’ve used it more times than I could probably count. It’s literally so good, I think it might be my 2nd or third most used Lush bath bomb. Yes the Fizzbanger bath bomb is in comparison to others, quite plain. As always though, it’s what is inside the bath bomb that counts! When you first pick the Fizzbanger up you can see that its exterior is all one colour, a very bright yellow. Up against the likes of heavily decorated, stand out bath bombs such as Frozen or Guardian of the Forest it can sometimes be over-shadowed. It is not until you place the Fizzbanger bath bomb in to your bath water that you notice its true potential. It is described as ‘a Catherine wheel of a bath bomb’ because it changes colour as it slowly fizzes away. Created to have individual scented layers the Fizzbanger is a feast for your nose as well as your skin. Everyone seems to think that the Fizzbanger is primarily a citrus lemon scent, I can see why people think this but the scent I always pick up is apple pie sprinkled with cinnamon sugar, MY WEAKNESS. I just can’t get enough of it both in the bath and as a yummy dessert drowning in custard. At first the Fizzbanger bath bomb creates a mound of yellow foam, it has often been described as resembling a nuclear explosion. This description is actually a very good one as visually that is exactly what it looks like. Once the yellow, foamy nuclear explosion spreads itself around the bath a fleck of the Fizzbangers blue interior can be seen. 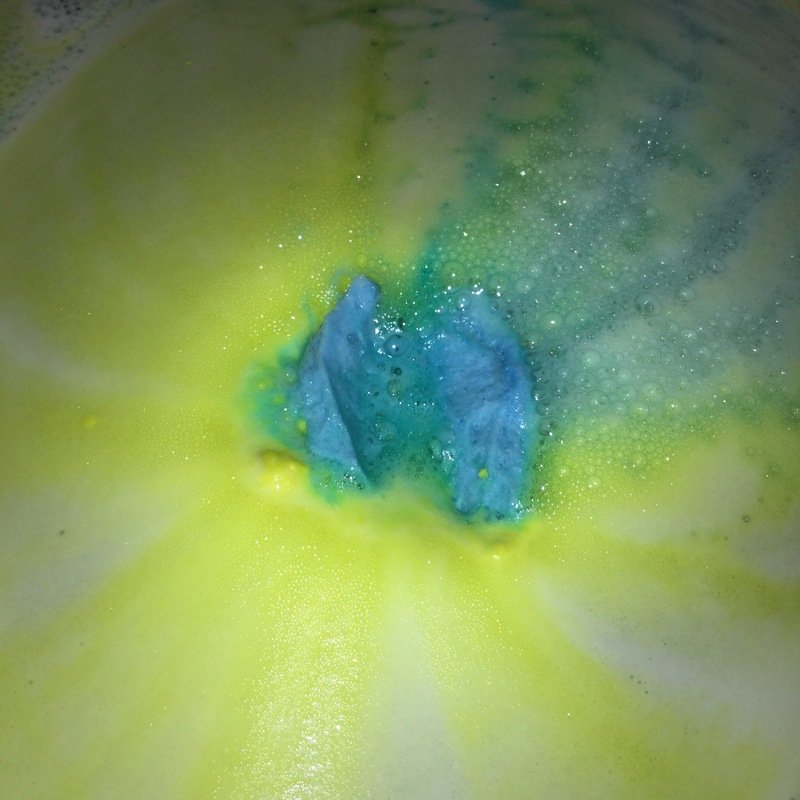 It slowly spins creating blue and yellow lines until the middle of the bath bomb reveals itself. Inside is a BANG surprise similar to the hidden paper insert of the Blackberry bath bomb. At this point you can also hear the popping candy within Fizzbanger reacting with the water. Petitgrain oil (the supposed primary citrus scent that I think is completely masked by the cinnamon and cooked apple scent) makes Fizzbanger a good choice of a bath partner if you’re in need of a pick-me-up. Petitgrain oil is used within aromatherapy through out the world because of its calming properties, it helps reduce the feeling of anxiety and put alongside ylang ylang and cinnamon leaf oil makes the Fizzbanger bath bomb a truly joyful and relaxing bath time treat. As the blue interior begins to show, the Fizzbanger bath bomb starts to spin making the most beautiful swirly blue and yellow patterns. It moves so quickly, it’s almost impossible to get a clear shot of. At the end you are left with yellow and blue bubbles sitting on the surface of your bath water. Underneath is the most striking, electric green water, infused with skin softening essential oils that are relaxing for mind, body and soul. I love to use a Fizzbanger bath bomb during the day as I find it really awakens my senses if I’ve had a restless night before hand. I was actually trolled a couple of years ago on Facebook when I mentioned that Fizzbanger was a good day time bomb. Madness I know, especially with all that’s wrong in the world right now. It just goes to show that not everyone knows the benefits of each essential oil. If every bath bomb’s ingredients put you to sleep they wouldn’t be as interesting to use. It was more of a personal attack to be honest, all I do all day is bathe you see, I’m SUPER ‘produtive’ like that 😉 Having been diagnosed with 2 conditions that have left me registered as disabled, using hot bath water to help ease the pain, is just so cheeky of me! – Lush baths have helped me no end, if I need a boost to get through the rest of the day Fizzbanger is my go to bath bomb. Its scent is to die for and the visual theatrics of it while it fizzles away is more than spectacular. I love how Lush makes it possible for effortless art to be created in your bath tub. When it comes down to a Fizzbanger bath, I cannot resist taking a few photos every time I use it, it’s just so, so beautiful.